Chabad news-site COLlive recently featured 2 English songs from JMR’s Mendel “the Sheichet”. The first song, titled Isn’t Your Cup Full? features touching lyrics by Pesha Leah Azoulay OBM, who wrote them a short time before her traggic passing just over a month ago. You can listen on the player below, or RIGHT CLICK HERE for free download (select “save target as”). You can also see the full post on COL by clicking here. The second song, titled Yacov’s Struggle is part of a project Mendel is working on based on the poetry of his friend Ian Heiss. Ian’s soon-to-be published book, Blueprints of the Universe, includes a poem for each Parsha in the Torah. Yacov’s Struggle is based on the poem for Parshas Toldos. You can listen on the player below, or RIGHT CLICK HERE for free download (select “save target as”). You can also see the full post on COL by clicking here. Both songs composed, performed and recorded by Mendel “the Sheichet” Markel at his home studio. Repost, share, burn and play them as you please, just give appropriate credit and Mendel appreciates all feedback and criticism. 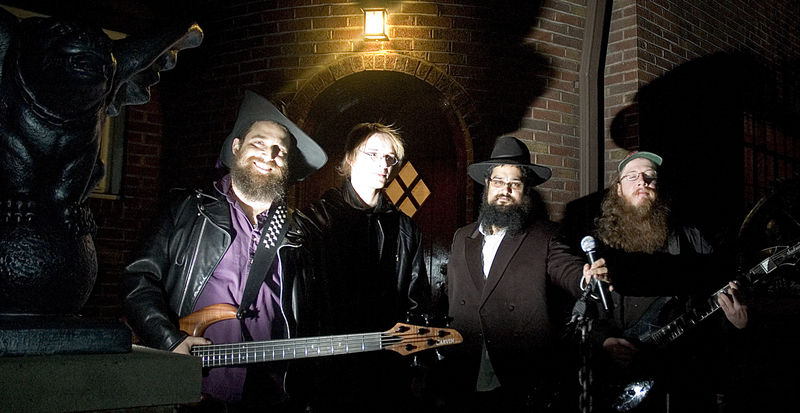 Pictured below: Mendel with his former band Teihu (L-R): Bear, Dima, Mendel “the Sheichet” and Yosel “the Shikker”. Doesn’t Yaakov wrestle with Eisavs angel in Parshas Vayishlach? After that in Vayishlach is when we get the name Yisroel…mybe this song is about Vayishlach? Yes, you are right. Vayishlach Yacov Mal’ochim lefanav el eisav achiv – thus begins the whole saga of Yacov readying himself for batte, splitting his children in 2 camps, being named Yisroel, etc. Thanks for correcting that.